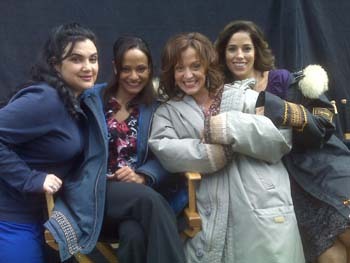 Actress Marlene Forte has secured one of the leading roles in the Lifetime Television Movie of the week called “Little Girl Lost: The Delimar Vera Story” sharing the screen with some of the most celebrated Latin actors of our times: Anna Ortiz (“Ugly Betty”), Judy Reyes (“Scrubs”), A. Martinez, Luz Ellena Rubio and Hector Luis. The movie is set to world premiere on Lifetime TV, August 16, 2008. Production just wrapped this week in Canada. Marlene is certainly having a “forte” year with also a co-starring role in JJ Abrams’ highly anticipated feature film “STAR TREK XI” (the prequel), opposite Chris Pine, Zachary Quinto, Eric Bana, Wynona Ryder, Simon Pegg, and Zoe Saldana, to name a few. Forte will be beaming people in her role as Chief Transporter. She was cast in Star Trek without going through the traditional process of auditioning. When JJ Abrams saw her demo reel, he instructed the casting director to hire her on the spot. Her other TV credits include a series of recurring and guest-starring roles such as FX’s “NIP/TUCK,” CBS’s “CSI Miami,” ABC’s “The George Lopez Show” and “My Wife and Kids”; NBC’s “Law and Order” and “Crossing Jordan,” and even worked with the Oscar winning director Paul Haggis on FAMILY LAW! More recently, Marlene continued to invade our small screens with guest-starring roles on hit TV shows including “Bones” (Fox), “The West Wing” (NBC), “Windfall” (NBC), “Jerico” (ABC), “Day Break” (ABC), “The Unit” (CBS), and “24” (Fox). More than an actress, Marlene is a “working” actress who has proven Hollywood wrong breaking every rule in the book! She sits comfortably at the top of her 40-something years of age and is enjoying a hell of ride carrying now an acting dossier that may very well rival some of the most prominent latinas in the industry. The story that lies behind Marlene Forte’s Hollywood success unfolds like a rags-to-riches movie script, but it is certainly a story rarely told and nothing short of “Forte’ Tude”! Her journey from the video counter to the big screen is one of great inspiration and motivation – proving that talent and persistence do pay off.